Located under 30km from Madrid, and within the metropolitan area of the capital of Spain, the city of Colmenar Viejo is found, home of M. Álvarez, a family business specialised in pickling. 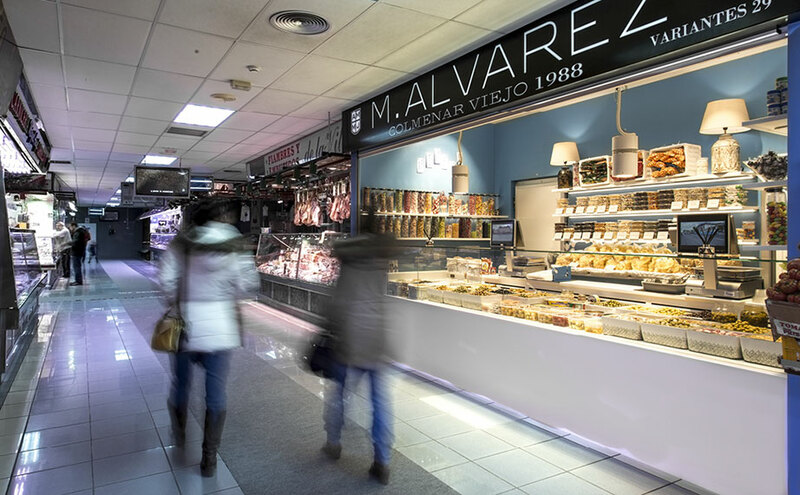 M. Álvarez was founded in 1988 by the Álvarez brothers, who have provided quality, service and smiles for over 28 years. Not only to improve the business, but also in order to repay their clients for their loyalty and trust, the 3 brothers’ business has undergone an EAVD renovation (energy efficiency, access, visual field and design). In charge of planning this spectacular change was the company Frivegar, specialised in the design of markets, large spaces and refrigerated facilities. In the design of modern and functional establishments, KRION®, the solid surface from PORCELANOSA Group, plays an important role, present on the counter, shelves, racks and doors with 1100 Snow White, and the covering with unnoticeable joins, using the 6701 Blue Sky colour. This comprehensive renovation with KRION® as the star material has received the praise of clients, and also design and architecture professionals.